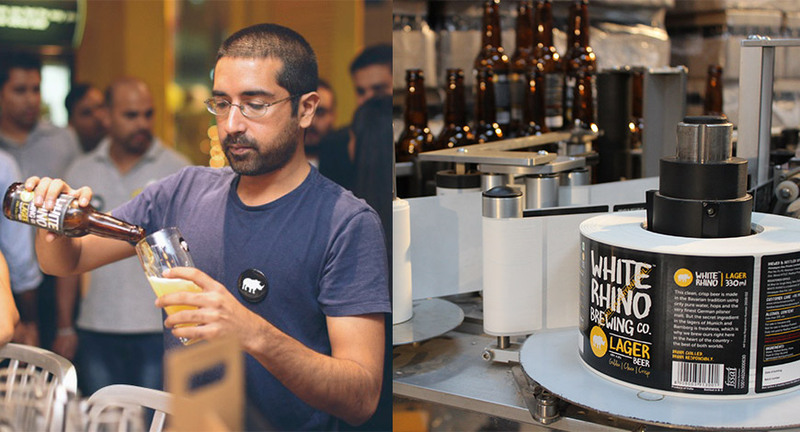 The founder and director of Indian craft beer White Rhino Brewing Co, Ishaan Puri, has long had a passion for brewing. After conceiving the idea for White Rhino he realised that to make great beer he needed to learn about the brewing process himself. He interacted intensively with breweries across the world before building White Rhino brewery followed by a fully equipped packaging facility. Now available across exclusive outlets in the capital, White Rhino is set to mark its footprint in Goa, Chandigarh, Mumbai, Pune and Bengaluru during the course of 2017. We chat with the young brewer to know more about his 'craft'. 1. How did the idea 'brew' in your head to launch your own beer brand? White Rhino arose from the need for better beer in India. The market has been flooded by mostly mass-market brands. The fact that the Indian beer scene needed a breath of fresh air from commercial lagers made me realise that here lay an immense opportunity – to make a beer for India that would stand up to an international standard. We wanted to create a range of authentic, small batch, high-quality beers that would cater to a niche market. More than just building a brand, we are brewers and it's the quality of the beer that matters to us the most. 2. India lacks good home-grown beer brands, how does White Rhino differentiate from whats available in the market? Compared to most other countries and given the potential for growth in India, the beer market isn't particularly crowded. We have a handful of mass-market, commercial brands (the ones you'll find in any country, such as Heineken, Fosters, Carlsberg, Miller, Budweiser etc. ), but in our segment there are not many serious players. White Rhino is a domestic craft beer and, while there are similar breweries in other parts of the country that supply draught beer to bars and restaurants, we are the only ones who are offering true craft beer in bottles. Also, the pricing is competitive, placed right between the mass market brands and imported ones which are anyway several months old by the time they reach the consumers. The local brewing gives us an advantage in a segment that many have tried to breach for years and the overwhelming response to the launch in Gurgaon and Delhi within a couple of months is proof that we've filled a void in the market. 3. What regions is White Rhino available in? The brand has been launched in the most exclusive places in Delhi NCR and will soon be followed by the introduction of it in Goa, Chandigarh, Mumbai, Pune and Bengaluru during the course of 2017. We have plans of entering other markets but we won't hit every market within our first year. 4. What is your attitude towards the competition- 'crafty' or 'cool'? To be honest we don't really have any competitors in our segment. We neither compete on price nor product with anyone directly. However, the craft beer space is small and we would welcome a handful of quality conscious breweries with whom we could join hands to really elevate the level of beer that is being brewed in India today. Craft brewing has seen such tremendous growth partly because players in this space don't try to kill competition. Rather, there's a sense of community because everyone is trying to make great beer and trying to educate the market. 5. It’s a lot of competition out there, how are you planning to market the new beer brand? As mentioned, in our segment there isn't much competition. We rely on word of mouth because, at the end of the day, it is a niche product. This has really done wonders for us. People really love our beer, they talk about it and recommend it to people. Of course it helps that we're available in all the right places. The bars and restaurants that we work with really care about the quality and variety they offer to their customers. They have been our beer's biggest brand ambassadors. 6. What is the marketing budget you've set aside? We don't rely on traditional marketing for our beer. A lot of it is word of mouth. Generally when we spend on "marketing" it's in the form of small events and collaborations with like minded companies. For us it's important to get the beers in the hands of discerning beer drinkers. 7. I lot of alcohol brands invest in music and youth centric events. What are your thoughts on marketing through events/experiences/promotions? It helps but the best marketing for a product like ours is word of mouth. Hands down. There's nothing like having someone you trust recommend a product. Of course when it comes to events and promotions we have to focus on our target age group and to that end youth centric events are important. 8. Will White Rhino be able to compete with a Budweiser, Corona, Heineken in the next 3 years? I see ourselves as one of the leading players in the craft beer movement, which is definitely going to grow. The craft beer movement in India has just started. Additionally, ours is the only craft brewery in India that is equipped with its own brewing as well as bottling unit. Mostly brands either sub-contract or import the beer from abroad. Budweiser, Heineken and corona are mass market brands and we do not compete with them.